All the pieces of this design are meant to uplift the client, instantly raising their mood and their hopes of what a new smile can bring to them. The people shown appear to be healthy and happy, many of the things that people with dental issues worry that they are not. The presentation of the professional who will be correcting the issues faced by the patients is set in such a way as to immediately begin building a connection between these design elements and the professional who will deliver them. The placement of the services offered comes at a stage in the page that indicates that relationships are more important than business, though in a subtle and understated way. The gallery located at the bottom is a way to round up the warmth and confidence generated by the visitors trip through the home page, just a reminder of what all this can do for them. The choice of colors for this site are both warm and welcoming, browns that pull you in and wrap you in an autumn blanket, subtle beige that exudes a professionalism and brightness that triggers uplifting feelings in the visitor. The splashes of color meant to generate soothing calm while adding pop to the page, take note of the blue scrubs worn by the dentist in the TMD/TMJ picture, and the color of the practitioners shirt. Given that many people get nervous when contemplating dental work, these little touches are important to generating the right feel. 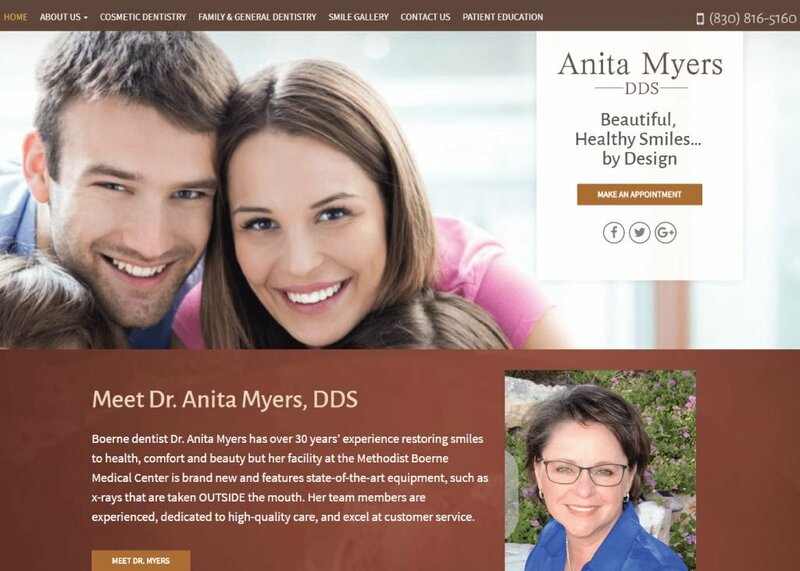 Contact information is located immediately at the top of this dental website, just over the ever-cycling slideshow of happy patients with newly perfected teeth. In some cases these two elements will be sufficient to get the patient in contact with the clinic, but the accessibility of the links at the top are for those visitors who want to get straight down to business and won’t scroll past the opening view. Information is presented in an attractive and comfortable flow, gently leading the customer through the site. This design focuses on selling the this professional from the first glance, introducing the patient into the results of the treatments that are about to be offered. Those looking for an experienced dental professional they can connect with will be drawn to this site as the dentist is introduced immediately in a warm, natural, inviting setting with a warm smile that shines with compassion. Directly at the top convenient links can be found to the various sub-sections of the site, but scrolling down will introduce you to these same services, as well as awards and certification that the office carries. This website reflects a welcoming family oriented dental practice that places relationships above business. The overall design reflects a willingness to share information slowly while making it convenient to obtain. The choice of colors continues this welcoming theme, while also maintaining the professional appearance and feeling of the site. If your site is meant to appeal to families and comfort the nervous or hesitant, this style would be a great option.